Wendy asked me to do these cupcakes for her friend’s 50th birthday. She wanted me to include Tracy’s name and the caption ‘on the ‘move’ as well as some 50’s. Her friend Tracy has a passion for travelling and she was about to embark on another adventure after celebrating her 50th birthday. I made some cute sugar paste suitcases by joining two oval pieces of sugar paste together and adding straps and handles to each suitcase. I added an orange letter to each green suitcase and a flower to the 2 yellow suitcases leaving the yellow ones slightly open while they dried. 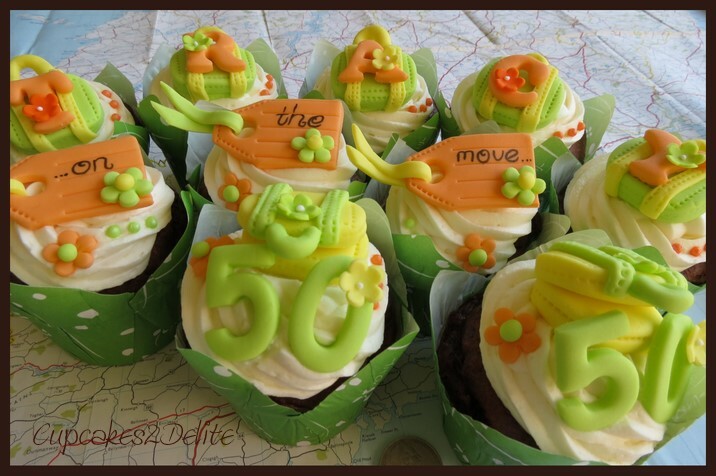 I added a 50 to the cupcakes with the yellow suitcase in the matching lime green and a funky orange blossom with green centre to tie in with the green, yellow and orange colour scheme. Of course no suitcase is complete without a tag on it so the tags were a perfect way to include the ‘on the move’ caption. I made the 3 orange tags and added a yellow sugar paste ribbon and tiny green blossom to each one. 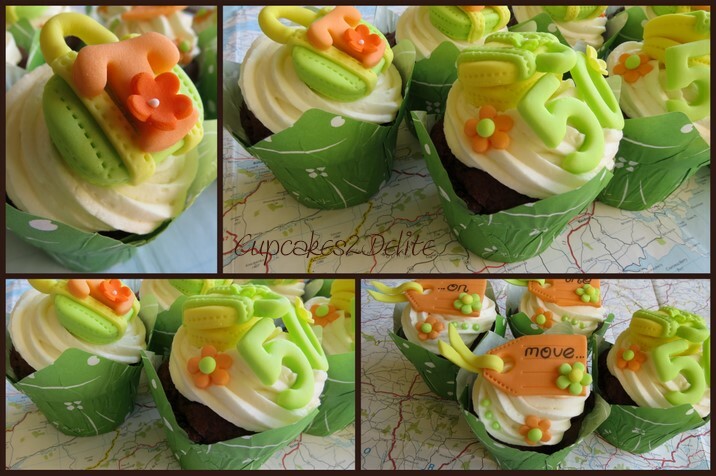 The perfect way to photograph these cupcakes was on an old map I had and a few odd coins from my own travels. These are gorgeous Lisa, love the colours. Do you have your baking shoes on again? Thanks Lisa, not baking yet although I wish I was. I made these a while ago for an order and just didn’t get round to blogging them then. Thanks so much Lorna, I love it when everyone gets as excited about my cupcakes as I do! These look brilliant babes. Love you! Thanks babes and hopefully I get back on my cupcake feet soon and the cupcake drought in the house will come to an end! Hi Lisa,Tracy on the move here. I struggle to find the words to express how delighted I was with my 50th birthday birthday cupcakes. The birthday tea was a surprise and the great reveal was literally breathtaking! The friends that I celebrated my 50th with are a very special group of ladies and we all share a precious friendship that has been a rock for all of us for 25 years. Visually all the cupcakes put together looked stunning, but the detail and thought that went into each individual cake and the message was amazing and hugely touching. I fortunately took lots of photo’s before we enjoyed the delicious art works. Because I am on the move all the time, these photo’s are getting around for all my friends to see and admire. Three months down the track, I still get emotional when I look at the photo’s. I am so lucky to have such special friends, who put so much thought into finding someone to make the perfect cake. Lisa your talent and the care and thought that you put into creating your special cup cakes is truly amazing. Loved it! THANK YOU. 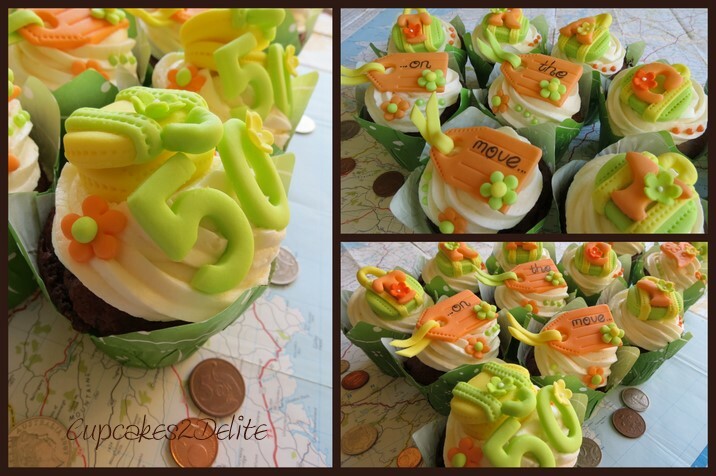 You are so welcome Tracy and thank you for such a heartfelt response to your Tracy On The Move Cupcakes. It is always a pleasure to do cupcakes for interesting people who are sharing special moments with friends. Lisa made these for my friend Tracy, who absolutely loved them! She lives in Oz but was in SA to celebrate her 50th birthday and to visit her folks. We assembled them on a cake board to make up her birthday cake and they were a perfect blend of fun, whimsy and elegance….and delicious to boot! Thanks and great job, Lisa! Thanks Wendy and your order was such fun to do with all the thought you put into this order for Tracy.